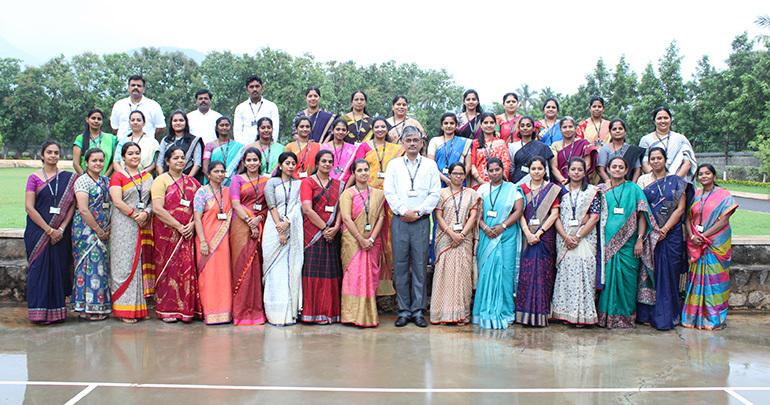 DPS Coimbatore has a fully trained faculty aided by a large support staff that includes helpers, researchers, house-keepers, trained paramedics, etc. DPS Coimbatore has one of the best employee remuneration programs leaving no stone unturned to provide career-enhancement opportunities with workshops, seminars, re-skilling programs, training, and advanced courses. This philosophy, pursued by TES, has ensured a low attrition rate in all its Schools, creating a happy workforce which takes pride in what it does. The dedicated staff provides student-focused individual attention making sure that each child keeps up with the peer group. Teaching is often described as a giving of knowledge. In reality, however, teaching is an experience that should encourage the teacher to learn, too. In fact, an already knowledgeable teacher, who is able to learn with his or her students, is a good teacher. This is the reason why at Delhi Public School Patna, Pune and Ludhiana, the Pedagogy and Synergy modules are conducted by the Master Trainers on every Saturday. Known as continuous professional development (CPD), this session -- usually in the form of workshops, seminars and training courses -- helps teachers stay up to date with new trends and learn fresh strategies, techniques and methods for classroom challenges. The overriding idea behind professional development is that increased knowledge helps teachers improve student achievement. That's because professional development focuses on what each teacher's needs to fine-tune his or her classroom practice. During these session, teachers learn for themselves and appreciate that how even trivial things can bring about a huge difference in the education delivery and understanding of the facts like what learning is needed, how can I improve my teaching, how can one create the class culture for learning, how can one teach to maximize results, problem solving, and how to orchestrate different aspects of pedagogy. After all, teacher development is the professional growth a teacher achieves as a result of gaining increased experiences and examining his or her teaching systematically.